Notes: Based on the manga by Sonoda Kenichi. Crackshot Rally Vincent and explosives-expert "Minnie" May Hopkins are the sole proprieters and employees of Gunsmith Cats, an ammunition-and-gunsmithing store down in the Windy City. However, Rally and May are better known to t he criminal and criminal-catching world as the best there is in bounty hunting. No matter how tough the case, how elusive the criminal, the Gunsmith Cats always bag their target in the end. One day, an ATF agent comes to Gunsmith Cats, making Rally and May an offer they can't refuse: a Class 3 weapons license in return for their assistance with a sting on a gun-smuggling ring. Swallowing their distaste for the rumply, cocky a gent, the two lend a hand, only to find themselves up against something much bigger than they had bargained for. Is someone higher up pulling the strings, leading Rally and May into a deadly trap? :-P~~~ (wiping off drool) Sorry about that little display of fan-boyishness... Anyway, Gunsmith Cats as an anime delivers much of what its manga predecessor offers (hey, none of that now! ), although the three episodes seem more like an appetizer than a main course. Fans will be delighted to see Rally, May, Becky, and most of the other regulars of Gunsmith Cats animated in full-color (Misty? Bean? Where are you?). While the art style is slightly simpler than Sonoda's manga work, it still manages to bring al l the action of the Cats across. The animation is smooth and fast when it counts, augmenting the action in all of its improbable glory. The writing is also true to the manga's style, with a fairly intelligent story (albeit slightly on the predictable side), lightly peppered with clever banter between Rally and May. Even the dubbing job isn't so bad, although I had always imagined May t o sound a little younger than she does in the tape. Still, everything adds up to a solid adaptation of the manga. Rally and May are lovely as always, the action is furious, and the humor is still always there in the background. The only complaint I have is that the series seems a bit too short. The three half-hour episodes would constitute just three parts in a ten-part chapter of the manga. 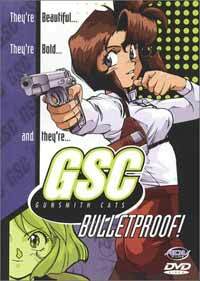 Could there be more Gunsmith Cats anime in production? But for a light, action-packed romp through the crime-riddled streets of Chicago, Gunsmith Cats is as good as it's ever going to get. Let's just hope more is in store around the corner. Recommended Audience: Some mostly-harmless fan service and occasional profanity keeps this anime from being appropriate for kids. Also, there are some scenes of moderately-graphic violence and gore (those extras don't come cheap, I tell ya). Parents may also be dismayed at the ubiquitous presence of firearms and explosives in the three episodes.